HEXUS readers certainly seem to be positive about AMD's Ryzen CPU range, which has now had some chance to have an impact on the market. 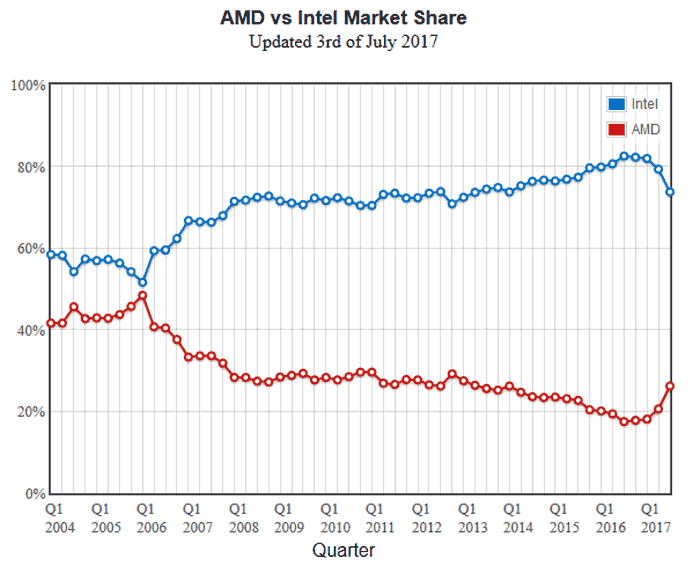 According to a new report from PassMark, AMD has made significant strides in recapturing market share from Intel in the last few months. Looking at Passmark's CPU usage graphs, derived from benchmarks completed using its software, we see that in Q4 2016 only 17.8 per cent of the tests were done on AMD hardware. Skip forward to the present day and the figure is 26.2 per cent. Pointing out the obvious - Passmark sees volumes of CPUs tested using its benchmarking software rather than numbers of CPUs bought in retail or other channels. This upswing for AMD is therefore likely to correlate to sales to PC enthusiasts rather than the wider market. Overall though, it is an indicator of changes for the good in terms of AMD's CPU market performance. We already knew that AMD would launch its consumer, gamer and enthusiast targeted Radeon RX Vega graphics cards at SIGGRAPH, later this month. This intention was signalled by AMD's CEO at the AMD Computex Press event which we reported on at the time. However, there were rumours circulating last week about a possible delay. Perhaps seeking to reassure the doubtful this weekend, the official Radeon RX Twitter account perkily confirmed the SIGGRAPH launch. 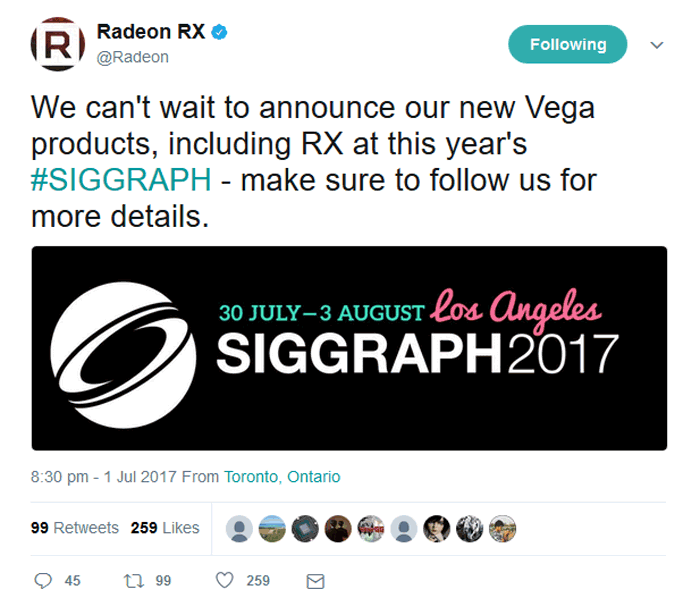 "We can't wait to announce our new Vega products, including RX at this year's #SIGGRAPH," said the official Twitterer. I went from always using Athlon, Athlon XP & Opteron, then I switched to Core2Quad when they came out and have seen no reason to switch back. Nice to see AMD on the up again :) They've been on the back foot for a while now. Definitely nice to see the upwards curve again! I think it would be best to get back to at least 55/45 Intel vs AMD but I would settle with 60/40!